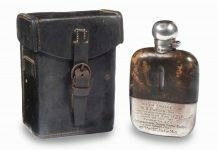 Would you Pay Up to $39K for Rem Fowler’s Isle of Man TT Hip Flask? The 2018 Isle of Man TT officially got underway Saturday with the first qualifying sessions in the Lightweight, Supersport and Sidecar classes. Topping the time sheet in the Supersport class was Dean Harrison (Kawasaki ZX-6RR), and Honda's Michael Dunlop (Paton) in the Lightweight TT class. With the withdrawal of John McGuiness on the SG7 Norton, and Bruce Anstey on the Padgett Racing Honda, Michael Dunlop will lead the Isle of Man TT superbike grids as the favorite. This year Dunlop will compete aboard BMW S 1000 RR machinery. New Zealand's Bruce Anstey is no stranger to cancer. The 48-year-old beat testicular cancer in the late 1990s, and continued competing in international road racing. The 13-time Isle of Man TT winner is once again dealing with cancer issues, this time to his lungs, says his partner Anny Ramsey. Fifteen-time Isle of Man TT winner has topped the headlines for the past few weeks, and more news arrived Tuesday. Dunlop has signed with the Factory Paton SC-Project Reparto Corse team, and will field an S1-R Paton alongside Stefano Bonetti during the 2018 Isle of Man Lightweight TT. he Isle of Man TT organizers are on a mission to name the greatest Isle of Man TT rider ever. Their strategy is simple - ask the public to vote. 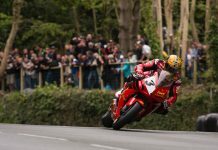 Over 1,400 TT fans have cast their vote at iomtt.com/vote. Now it's your turn. Following a year of competition aboard Suzuki GSX-R1000 machinery, Michael Dunlop returns to the 2018 international road racing scene with BMW. The 15-time Isle of Man TT winner has signed with Tyco BMW, and will field a TAS-Racing prepped S 1000 RR during the 2018 TT. Two of the Isle of Man TT's top riders will unite for the Supersport races. The 45-year-old "Morecambe Missile" will compete alongside his biggest rival, 16-time TT winner Michael Dunlop, the nephew of the late Joey Dunlop who continues to hold the record for TT wins at 26. More McGuinness news arrived Tuesday, and once again the story doesn't involve Honda. KMR/IEG Kawasaki confirmed that the 45-year-old will compete on ER650 machinery during the four-lap Bennetts Lightweight Race during the 2018 Isle of Man TT. Due to his positive last-minute 2017 TT efforts, Dan Kneen has signed with Jackson Racing Honda to compete in both 2018 Isle of Man TT Supersport races. Bye bye Honda - for 2018 Isle of Man TT, John McGuinness, who is recovering from a North West 200 crash, will compete aboard a factory Norton SG7. Josh Brookes, the 2015 British Superbike Champion, returns to the TT for 2018 with Norton, this year piloting the SG7 that's based on the V4 RR. For 2018, the 32-year-old William Dunlop is already locked in with the Temple Golf Club Yamaha team, and will pilot R1M and R6 machinery during the solo events. For the third-straight year, former Moto3 racer Danny Webb will compete on the German Penz13 BMW Motorrad Motorsports S 1000 RR during the Isle of Man TT. For the ninth-straight Isle of Man TT, James Hillier will compete on Kawasaki machinery under the new Quattro Plant JG Speedlift Kawasaki team.